An airless hose is used in a wide range of applications to provide even, consistent fluid management for your particular application. Airless hoses use high pressure in order to force an otherwise viscous liquid applicant through an airless spray tip. The result is that the fluid is disrupted and a solid stream hits the air, resulting in a fine mist. For paint applications, an airless paint sprayer hose helps create an even coat on uneven surfaces. For sandblasting applications, the abrasive material is forced at high pressure through the airless hose in order to clean surfaces. 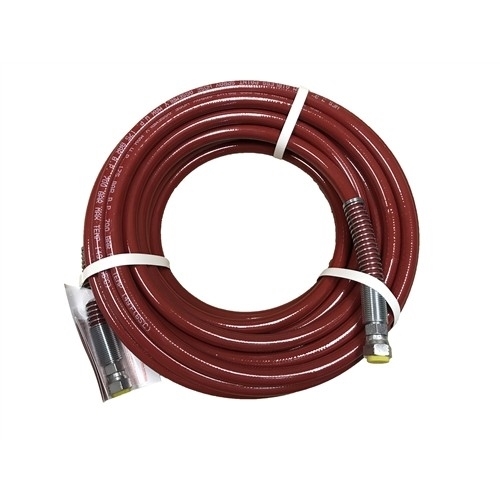 This airless hose is nylon-based with PE fiber reinforcements so it can withstand high-pressure use. The outside is covered in thermoplastic polyurethane, so it's durable and ready for any work environment with temperature ratings of -40C to 100C. We offer ¼” and ⅜” hose in a length of 50 feet that comes with female fittings and spring guards on both ends. 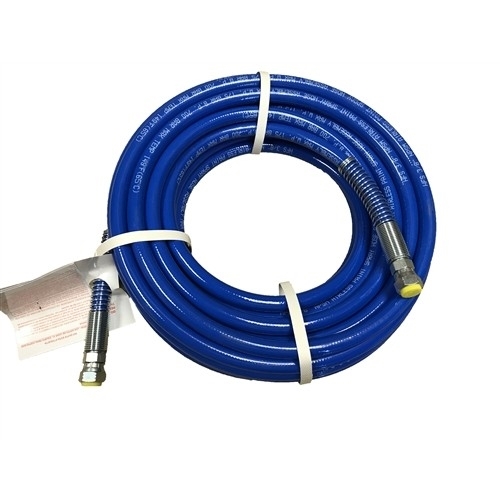 Shop for an airless paint hose and airless sandblasting hose with Hose and Fitting Supply today!